Balancing the challenges of going from an adolescent to an adult with CF can be difficult. Early on, parents are the leaders in their child’s care. They take on almost all the CF care responsibilities to ensure their young child remains as healthy as possible. As a child grows up, it’s important the parent transfers CF care responsibilities to their child. While this can understandably be a bit scary, transferring the ownership of care in a structured and carefully managed way can ensure the development of an independent young adult living with CF. The timeline below identifies CF-related milestones—it focuses on giving parents, support teams or someone living with CF the ability to assess his or her ongoing development. 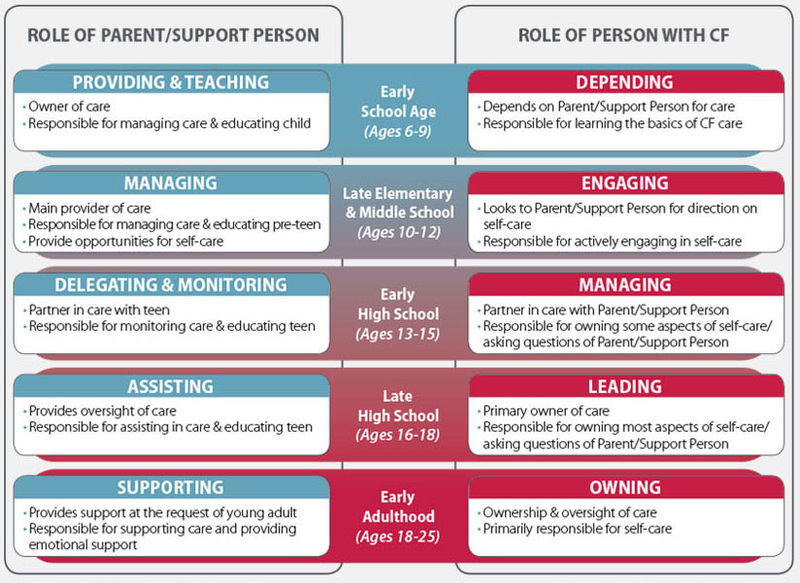 This chart outlines the evolving role a parent or support person may play in transferring responsibility of care to their child. Get an overview of the increasing accountability a person with CF will take on as he or she ages. Keep in mind, while responsibility shifts over time, it’s typical to be earlier/later than what’s indicated on the chart. Adopted with permission from: Kieckhefer GM, Trahms CM. Supporting development of children with chronic conditions: from compliance toward shared management. Pediatr Nurs. 2000;26(4):354-363. Care teams and those living with CF can zero in on their progress to identify and confirm that goals are reached at the right time.